I don’t want to bore you by telling a story that spreads through a century and three generations. On the other hand, I have no other choice but to tell you about it. That’s how grateful I am for everything my family taught me. I take great pride in having the same name as my grandfather Diego. Alas, I never met him. When I asked my dad to talk about him, he always told me he was his greatest friend and teacher. Exactly as my father was to me. … Ebanisteria Meccanica. I was struck by that name, when I was a child. I first heard it from my grandmother. My grandfather learned his trade in the Falegnameria Clemente, an old artisan carpentry in Sassari, during the early ‘900s. Soon after he decided to open his first workshop. The year was 1931. Those were the times when all the work had to be done by hand. No machinery existed yet. You had to toil on the hand plane, the saw, the rasp. My grandfather did every work with wood conceivable, not only furnishing; he was interested in lutherie, fascinated by every object, and he did everything from structural jobs to carving and art. All those who met him say that he was painstakingly precise at his job, a rigorous master, a great ebonist artisan and an even greater man. Years passed, and the first mechanical tools arrived. My grandfather called his shop Ebanisteria Meccanica: quality woodworking that becomes Mechanical. My grandfather passed away when my dad was 18. Bravely, he decided to bring the trade and the business forward. Kitchens, furniture, tables and… an unmistakable symphony. Inside my father workshop I learned everything I know. From him and from all the craftsmen who lined behind the benches creating kitchens, furniture, tables, staircases. I remember there was no such a thing as silence in the workshop: you could always hear the machinery running at full speed, all day long. Even when they shut down the rhythm of the hammers mixed with the scraping of the sandpaper finishing the products. A symphony that mixed with the scent of the sawdust of many different woods swirling around. Kitchens, furniture, tables, staircases, every kind of woodworking you can think of, executed with the mastery and the skill of an artist. My dad was Master Moretti. He was a great man and a superb ebonist artisan. 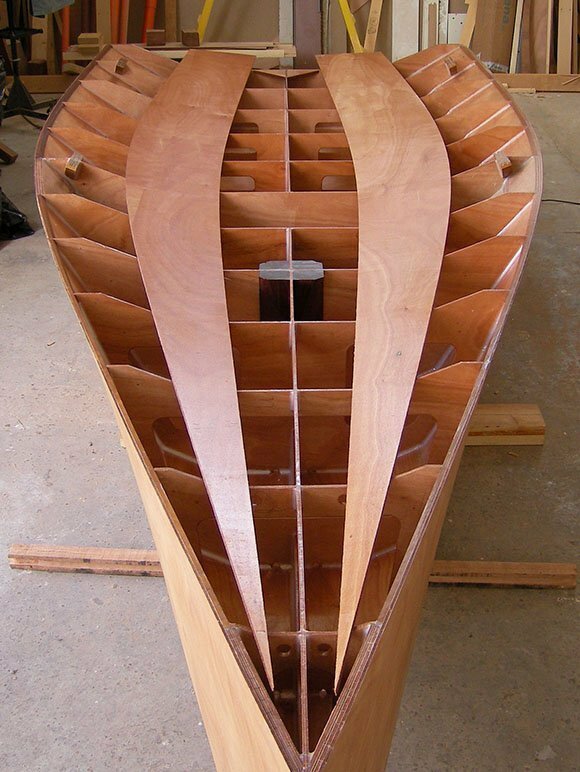 In 2003 I was asked to build a prototype for a boat’s hull. I was drafted in Sassari and while by day I had to stay in the barracks, by night I went to the building site to work on the boat. 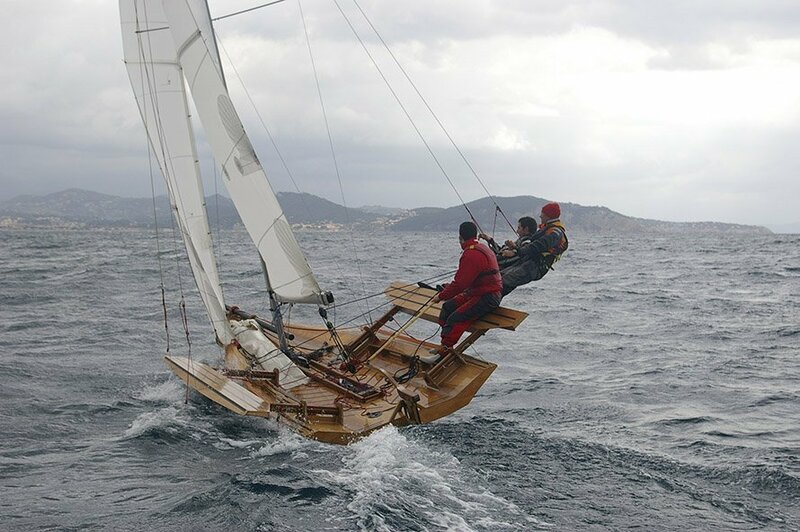 In 2004 Protonio (this was the name of the hull) took part in the Gran Pavois de La Rochelle, the international sailboat fair in France, and it won the prize “Colpo di Fulmine” for the most beautiful wooden sailboat. I can’t fail to mention it also received a special mention both for the project and the techniques I used to build it. From there my life took a turn. My horizons widened, and I chose to dedicate myself completely to building hulls for boats. I built three boats: Protonio (2003), a launch (2006), and “il Velivolo” (the aircraft) in 2007, which also took part in many international boat shows. In 2005 I left for Cantù, a famous Italian furnishing city, the heart of all cabinetry, design and wooden furniture building. There I worked, learning about culture and my trade from the artisan workshops and the seminars on wood and product design. After spending two years in Brianza I came back to my Sardinia and built my very first motor launch on commission, just before building “Il Velivolo”. In 2008, having finished and tested “Il Velivolo”, I officially opened Cantiere Moretti, a workshop specialized in building boats and structures all strictly done with wood. Hard Times. Times that call for a choice that goes “upwind”. During those years the Cantiere had evolved, moving from shipbuilding to traditional detail cabinetry. Still, I always kept my taste for innovation and creation of original products. I started studying furniture making and cabinetry, to combine them with new materials, shapes and functionalities. These were hard times: detail sales were rapidly disappearing, “thanks” to the big retail chains. While I stopped waiting for jobs that almost never came, my heart was still set on my goal: I had to continue with my trade. In 2012 I created the bookshelf “Libreria ad Incastri”. The project, chosen for the “Young & Design” prize, received a special mention by the “Salone del Mobile”, in Milan. It was a sophisticated project, even though it aimed for simplicity, be it in his construction, use or transportation. From there on everything changed. 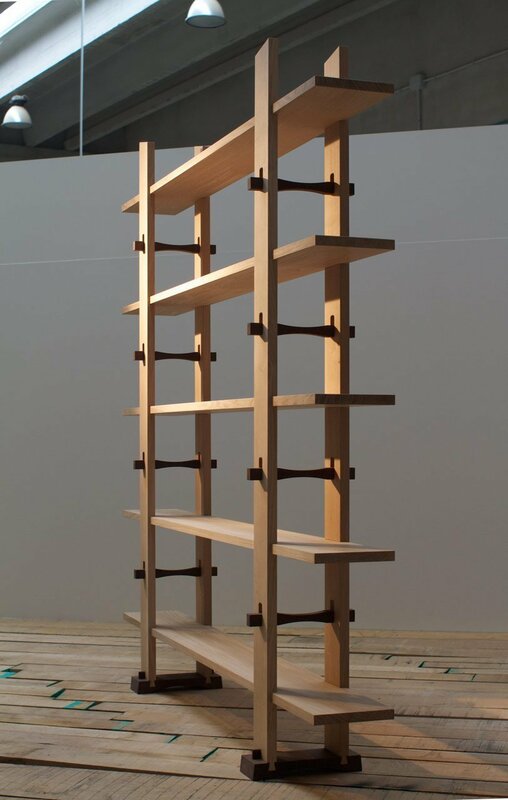 The bookshelf and the philosophy behind it represent a radical departure, coming to life my most important choice: the EBANISTERIA MECCANICA was reborn. I decided to give new life to this beautiful name, so precious to me, creating a new brand that exalts the well-designed object, made and polished exclusively by hand. High quality creations made and polished by hand, united with the making of classical objects both for furnishing and utility. In the years that came after that I created the lounge table “Disquadro”, and then the “Mesurè” line (dialect for “my sister”), composed of a cupboard, a cabinet, a nightstand, and the coat valet “Servomuto”. Today my dad, my greatest teacher, is not here anymore. But he still stands by my side, every moment of my life. I feel it is my responsibility to bring everything I learned into the future. It is not only a precious tradition: it is the dearest thing that I have.